Polenta is a on the menu a lot in our house because it's fast to make, the kids love its texture and there are so many different variations on it I can make that range from savory to sweet. Although I usually like to pour the cooked polenta on to a cookie sheet and allow it to cool before the kids cut it into shapes, this soft polenta recipe is a dish they adore equally as much Breakfast Polenta or Polenta Cutouts. 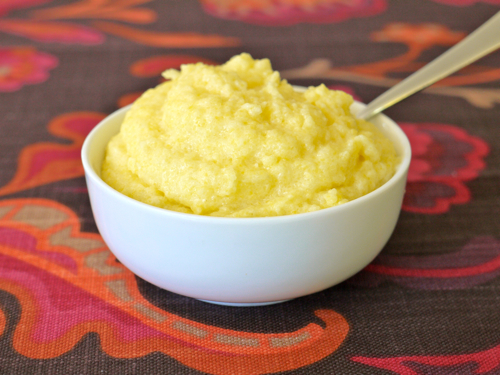 Soft polenta has a consistency closer to that of Cream of Wheat or even oatmeal. Served under a piece of chicken, shrimp, fish, steak, or even on its own, this quick and creamy side dish is perfect for a busy night when you need something delicious on the table in less than 10 minutes. 1. Bring water and 1 tsp of salt to a boil. Slowly whisk in polenta, stirring continuously for about 2 minutes or until it starts to thicken. Reduce heat to a simmer. 2. Whisk in butter, cream cheese and parmesan until thickened and cook the polenta for an additional 3 minutes (or according to package directions). Can this recipe be made without the dairy? My DD and I are allergic to dairy and I was wondering if it would alter the texture or the taste? Thank you for your wonderful recipes!! You can make this with rice milk, but it will not get the same creamy texture that it would have with the cream cheese or parmesan. It would change the taste though. My friend Garrett was over the other day, and made for me these fauulobs cheddar jalapef1o biscuits. I’ve since made them several times and each time they disappear within minutes. They are surprisingly light in texture and crumb, given the amount of cheese and cream. The secret ingredient? A quarter cup of cornmeal or polenta added to the flour. Just that amount lends a slight crunch to the biscuit, without making it gritty. The cornmeal of course works beautifully with the jalapef1os and cheddar cheese. Garrett tops the biscuits with extra grated cheddar, giving them an even more cheesy edge. Perfect for breakfast, brunch, an afternoon snack, or served alongside a hot bowl of chili. Looks delicious, I want to cook more polenta and this has inspired me to get back to use it more. Thanks! We love polenta topped with roasted vegetables. So good! YES! I'm so excited to try it, thanks so much Catherine! I'll make polenta for dinner tonight! I have never made polenta but want to give it a try. I would love it if you would post different variations for those of us not creative enough to figure it out for our selves :-) sweet, savory, bring it on! Polenta is coarse cornmeal aka \"grits\". I usually don't get the quick cooking kind (Next time I'll look for some for convenience). I like Bob's Red Mill Corn Grits Polenta---mind you this is not a convenient product if you want to cook something in 10 minutes. I tried this today. It tasted really great, but the texture was gelatinous. Any suggestions? I used 1/3 reduced fat cream cheese, maybe that was the problem. Made this the other night-sooo good! Also used reduced fat cream cheeese and didn't have have much of a problem with texture. Was pleasantly surprised that it all came out so smooth considering that i did not have the cream cheese at room temperature before adding to pot. Will definitely try this dish again as it seems to be a versatile side. Thanks! I just made ths, added some herbs at the end, and it was delicious...BUT, i wound up with a few lumps in my polenta. I cooked it precisely as described, any ideas as to what happened?